Faculty Websites Will Be Unavailable on Saturday, December 21st. Faculty Websites will be unavailable from 6 am – 12 pm on Saturday, December 21st. Continue Reading Faculty Websites Will Be Unavailable on Saturday, December 21st. 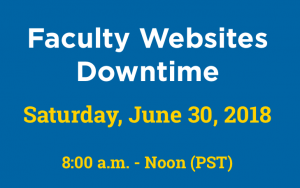 Faculty Websites will be down on Saturday, June 22 from 6am – noon. The Office of Information Technology will be performing systems maintenance that will impact a number of campus systems, including Faculty Websites on Saturday, June 22nd. Due to this maintenance, Faculty Websites will be unavailable on Saturday, June 22nd from 6 am – 12 pm (noon). We will have a short downtime from 10 – 10:15 pm on Tuesday, May 7, 2013. We need to do an update to our Domain Mapping plugin for WordPress. If you have any questions or concerns, please contact us.